Learn How a Cosmetic Dentist in Calimesa Can Make Your Smile Shine in 2019! Most people focus on improving the health and appearance of their body at the New Year, but why not do something different in 2019 and focus on your smile instead? Many people endure years of feeling self-conscious or embarrassed of their smile, which holds them back from feeling comfortable in personal and professional situations. But transforming your smile is easier than you might think: A cosmetic dentist in Calimesa can do a variety of procedures that will make a big difference quickly. 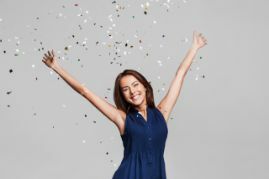 Keep reading to learn about some of the most popular cosmetic treatments that can help you love your smile in 2019! Whitening is one of the most requested procedures and will deliver great results for a relatively small investment of time and money. However, since the FDA limits the strength of over-the-counter products, you’ll get the safest and most reliable results from a professional treatment. How does it work? After a dentist in Calimesa makes custom trays, you’ll fill them with a professional-strength whitening gel and wear them for 30-60 minutes a day, for about 10-14 days. Most people need annual touchups and can do that using their original trays for many years, only needing to purchase inexpensive refills of whitening gel. A “gummy smile” – If your teeth look short or small when you smile, this will lengthen them and give you a beautiful, well-proportioned smile. Uneven gums – You might think that your teeth are uneven or misshapen, but the issue is actually uneven gum tissue. Once the gums have been reshaped, the teeth will appear much more uniform. Also called cosmetic bonding, this involves using white filling material (the same material used for tooth-colored fillings) to repair small imperfections on the front teeth. It’s great for small chips, cracks, cavities and discolorations. If you’d like to know more about which of these procedures will give you the best results, the first step is to schedule a consultation with a cosmetic dentist. In some cases, they may simply recommend a whitening treatment. In others, more than one procedure may deliver the best results. Either way, you’ll be one step closer to achieving your best smile yet in 2019! Dr. Scott Parker is a general and cosmetic dentist in Calimesa who loves helping his patients feel great about their smiles. He knows that every patient is different, so he works closely with each one to create treatment plans that serve their needs the best. If you’d like to enhance your smile in 2019 and have any other questions, he can be contacted through his website or at (909) 795-6019. Comments Off on Learn How a Cosmetic Dentist in Calimesa Can Make Your Smile Shine in 2019!